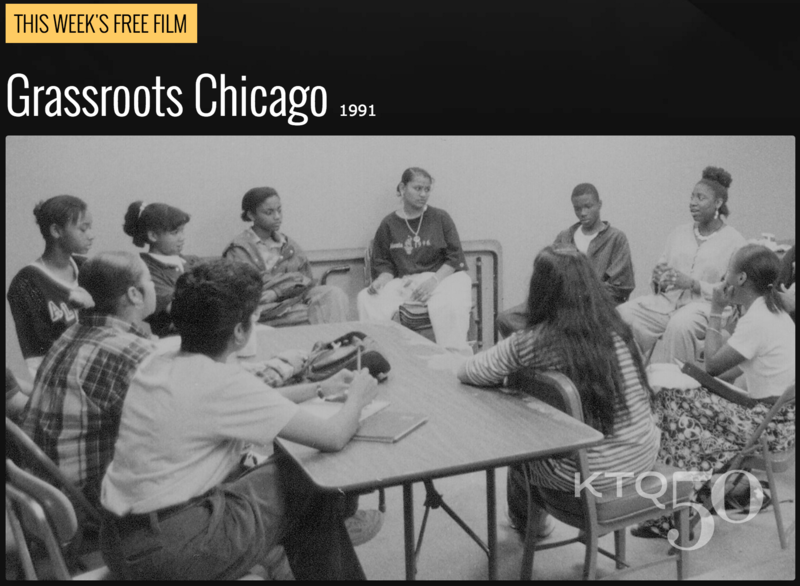 From today until next Friday, May 20th, the free KTQ50 film is Grassroots Chicago (1991). A film that addresses the successes and challenges of community organizing in several Chicago neighborhoods. This 30-minute Kartemquin documentary from 1991 - the debut of Life Itself and Hoop Dreams director Steve James - tells the story of the vibrancy of grassroots organizing in Chicago and how community groups in the city work for social change. Originally produced for the MacArthur Foundation by Gordon Quinn and Jerry Blumenthal, this piece features six vignettes on community organizing in different Chicago neighborhoods: LeClaire Courts, Marquette Park, Roseland, Pilsen, Uptown, Rogers Park, and Garfield Park. ARTICLE: Grassroots Chicago was Steve James' very first shoot! You can read more about this experience in the My First Shoot interview here. We're turning 50, so for each of the 50 days before our big bash on June 24, we will be giving away a ticket to our #KTQ50 Birthday Party. Join us on the Harris Theater Rooftop for an unmissable and unique party starting at 8pm, featuring five decades of KTQ filmmakers, film subjects, staff, alumni, and fans. Every day at 12pm CST, we will post a photo still of one of KTQ’s films from our 50 years of documentaries on either our @Kartemquin Twitter or Facebook account. Follow us on social media to be the first to identify the film. Just name the film, include the hashtag #KTQ50, and the ticket is yours! Play along daily for a chance to win! You can also buy your ticket at a www.ktq50.org. In 2016, several organizations in Chicago and around the country will host a series of screenings and events to celebrate Kartemquin’s 50th anniversary. We also invite you to watch all our films for free, week by week, at http://watch.kartemquin.com. See the full #KTQ50 streaming schedule and more information at www.kartemquin.com/ktq50.